A recent letter from the Vatican reminded the world's Catholic bishops of a rule mandating the use of wheat gluten for the celebration of the Eucharist, a Christian liturgical service called the Mass by Catholics. Reactions were immediate. Catholics with celiac disease recounted their experiences in trying to find low-gluten options and even approaching priests before Communion to receive consecrated wine from a separate chalice so there was no chance of cross-contamination. Some narrated how they had even refrained from receiving Communion and decided instead on a "spiritual Communion." As a specialist in liturgical studies, I was not really surprised. Today in North America there is an intense concern about the nature of bread used for Communion by Catholics - celiac disease, caused by gluten intolerance, affects at least 1 percent of the global population. But while the Catholic Church does allow low-gluten breads, the use of gluten-free recipes has been strictly prohibited. The reasons can be found in historical challenges to Catholic Christian practice. Since 1588, the Vatican Congregation for Divine Worship and Discipline of the Sacraments has been responsible for clarifying how to uphold longstanding Catholic liturgical traditions. According to Catholic canon law, only fresh unleavened bread made from pure wheat with no additional ingredients may be used for the celebration of Mass. Gluten is part of what makes wheat actually wheat. The celebration of the Eucharist, in which the blessing of bread and wine is communally distributed as the body and blood of Christ, is rooted in the gospel traditions of Jesus' Last Supper with his apostles on the night before his crucifixion. Three of the gospels present Jesus sharing bread and wine with his 12 disciples, stating simply that the bread was his body and the wine his blood, and directing them to repeat this act in his memory. In the fourth gospel, Jesus offers a final discourse, stressing themes related to his sharing of the bread and wine in the other three gospels: the enduring union of a believer with himself and the Father, the continuing presence of the Holy Spirit in the community and the responsibility to live as Jesus had taught. From Christianity's earliest days, Christian leaders taught that, at Baptism, human beings become living members of the body of Christ through this sacramental incorporation into the Church. These baptized Christians were understood to reaffirm this unity with each other and with Jesus Christ himself in the celebration of the Eucharist and the reception of the consecrated bread and wine - an important spiritual and theological reality for the community. 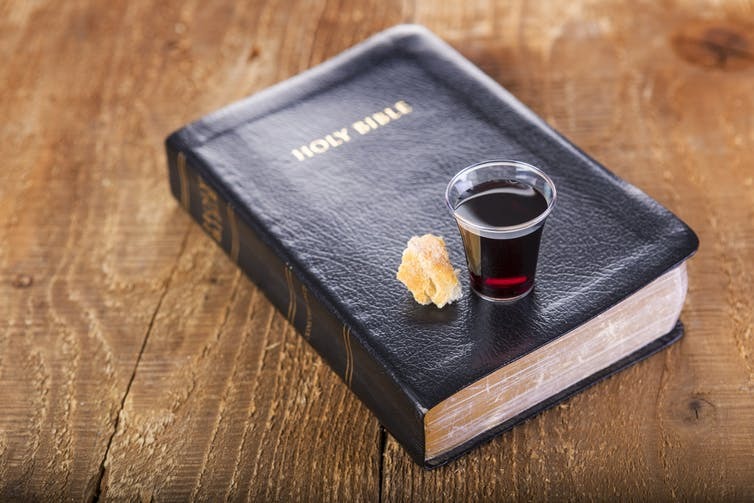 It is for this reason that ancient Christian authors repeatedly stressed that the bread and wine really became the body and blood of Christ through the priest or the bishop's prayer over the elements of bread and wine. By the second century, however, radical interpretations of Christianity appeared among the diverse Christian communities. The most widespread challengers, the Gnostics, insisted that the material world was evil and human spirits needed to free themselves from the prisons of material human bodies in which they had been imprisoned. For most, the idea that the son of God would become incarnate in such a human body was abhorrent; some held the "docetic" belief that the physical body of Jesus was only an illusion. The Gnostic Gospel of Philip stressed that the real body of Christ was his teaching, and his real blood the vital presence of the Holy Spirit in the community. That led Gnostic Christians to reject the use of bread and wine entirely, or use different prayer formulas to express the primacy of spiritual reality. While these were fiercely opposed by early Christian bishops and theologians, there were differing opinions about whether yeast could be used or not, even among faithful Christians. Communities interpreted the Passover setting of Jesus' Last Supper in different ways. In the eastern part of the Roman Empire, the use of bread leavened with yeast and allowed to rise continued to be the usual practice, while in the west, unleavened bread became the norm. The two distinct practices continue to this day: Eastern churches, whether in union with Rome or not, use leavened bread at the Eucharist, whereas Roman (western) Catholics do not. Over the next thousand years in Western Europe - the complex period of time commonly called the Middle Ages (fifth to 15th century) - a number of shifts in ancient Christian practice took place. By the early Middle Ages, religious communities (instead of ordinary laypeople) undertook the responsibility of preparing "altar breads" for use at Mass. In this way, churches could acquire bread for the Mass with real assurance that they were prepared properly. 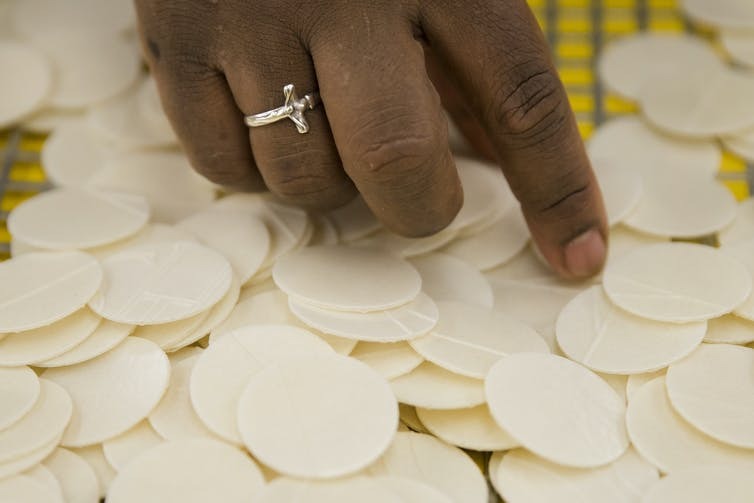 These flattened disks came to be called "hosts," since the Mass was understood to be an offering of Christ's sacrificial death on the cross (the Latin word hostia means "victim"). Later medieval discussion about the Eucharist was shaped by the question of sacramental validity: Under what conditions is a sacrament really valid? In other words, when does it legally count? Sacramental validity came to be explained as requiring both valid matter (the correct physical element involved) and the correct form (the correct liturgical text or "formula" to be used, usually by a priest). In terms of the sacrament of the Eucharist, only wheat bread was judgedto be valid matter, although some discussion did take place about whether other grains could be mixed in. By the end of the medieval period, critics of the traditional liturgy became more vocal, and western Christianity was divided into two major "camps": the traditional Catholics and a growing cluster of "reformed" church communities known generally as "Protestant" churches. Protestant churches in general rejected the Catholic interpretation of the meaning of the Eucharist. Some denied the real presence of Christ in the Eucharistic bread and wine, and discarded the Catholic definition of "valid matter." Over the next few centuries, numerous Protestant denominations were formed, many using the ordinary bread consumed at daily meals in their Eucharistic services. In response, the Catholic Church condemned Protestant practices and stressed the traditional requirements for these elements even more forcefully. Until the Second Vatican Council (1962-1965), specially produced altar breads were exclusively used as hosts. As part of its program for Church reform, Vatican II called for a revision of the Catholic liturgy, including the Mass. The post-Vatican II Roman Missal (1970), the liturgical book used for the celebration of Mass, contained the new directive that, if possible, the bread used at Mass look more like actual bread. The ingredients were still limited to wheat flour and water. These "ordinary gluten" altar breads could still be baked at home by lay members of the community. Today, the traditional-style hosts continue to be used in most places, and some of the producers have developed recipes for low-gluten hosts as well. However, for Catholics who suffer severe gluten intolerance today, there still aren't many choices. Those who can tolerate a small percentage still may need to find a way to introduce low-gluten altar breads in their local parishes. Those with severe intolerance may receive Communion only from the chalice. In either case, they must avoid cross-contamination by keeping low-gluten hosts and wine strictly separate from any contact with the full wheat hosts. It is a sad irony, I believe, that the same measures taken by the Church to safeguard this sacrament from what was understood as heresy now result in denying a small but significant number of Catholics from fully participating in their deepest source of spiritual strength and identity. Joanne M. Pierce is the Professor of Religious Studies at the College of the Holy Cross. This article first appeared in The Conversation.